Berlioz’s Christmas oratorio, L’enfance du Christ, performed by the BBC Symphony Orchestra, Chorus, Singers and star soloists, conducted by Edward Gardner. Berlioz’s Christmas oratorio L’enfance du Christ. 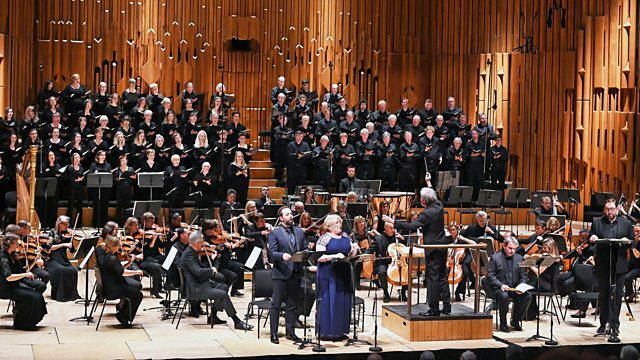 Edward Gardner conducts the BBC Symphony Orchestra, Chorus, BBC Singers and star soloists. Berlioz’s oratorio L’enfance du Christ (The Childhood of Christ) , home to the much-loved ‘Shepherds’ Farewell’ chorus, is a ravishing retelling of the Christmas story with echoes of Bach’s Passions. Premiered in 1854 the French composer’s inimitable stylistic fingerprints combine in the work to produce music of tender ‘celestial’ beauty, operatic flair, and dramatic instinct. Edward Gardner conducts a superb cast and continues the 90th birthday celebrations of the BBC Symphony Chorus. Singer: Karen Cargill. Singer: Robert Murray. Singer: Étienne Dupuis. Singer: Matthew Rose. Choir: BBC Symphony Chorus. Choir: BBC Singers Women's Voices. Orchestra: BBC Symphony Orchestra. Conductor: Edward Gardner. Orchestra: Leningrad Philharmonic Chamber Orchestra. Conductor: Yevgeny Mravinsky.